As you know, the Rochester Falconcam is operated by the Genesee Valley Audubon Society, a not-for-profit organization as defined under section 501(c) 3 of the US Internal Revenue Service code. We operate on a limited budget and we depend upon the generosity of our fans for the majority of our funding. So you can imagine how happy we were to learn that a group of dedicated Fans of the Falconcam have pooled their talents and energies to raise money for the Rochester Falconcam! Their imaginative program is called “Bricks for Chicks“, and here’s the story. For as long as Peregrines have been nesting on the Kodak tower, adults and fledglings alike have used the three smokestacks at the RG&E BeeBee Station as convenient landing spots and hunting perches. On their early flights, these tall open cylinders can present hazards for the fledglings, and more than one has needed rescue over the years. Once they’ve learned to control their landings, the fledglings have found the smokestacks to be excellent places to eat, rest weary wings, or just hang out. The recent renovations at the BeeBee Station will leave only one smoke stack standing. In commemoration of the role these industrial relics have played, our friends in the Bricks for Chicks program have obtained a limited supply of the original masonry from the center and northern smokestacks that are being demolished. Now you too can own a little piece of Rochester Falcon history, and support the Rochester Falconcam program at the same time! Click the Bricks for Chicks link above, or click the button at the right to get your brick, and other fine commemortive photos of the Rochester Falcons. (you’ll need Adobe Acrobat Reader to open the document. If you don’t have it, you can CLICK HERE to get it). 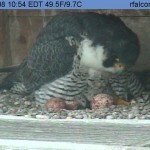 Help keep the Rochester Falconcam running. Visit Bricks for Chicks! 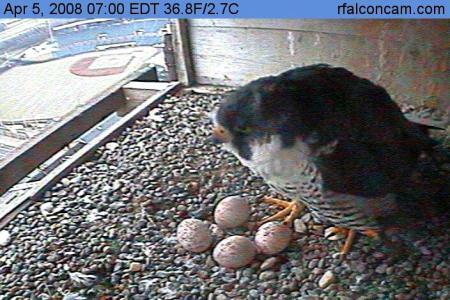 We’re really excited about this community-centered effort, and the Rochester Falconcam extends our gratitude and heatfelt thanks to the folks at Bricks for Chicks, and to you, our generous fans, for your continuing support! 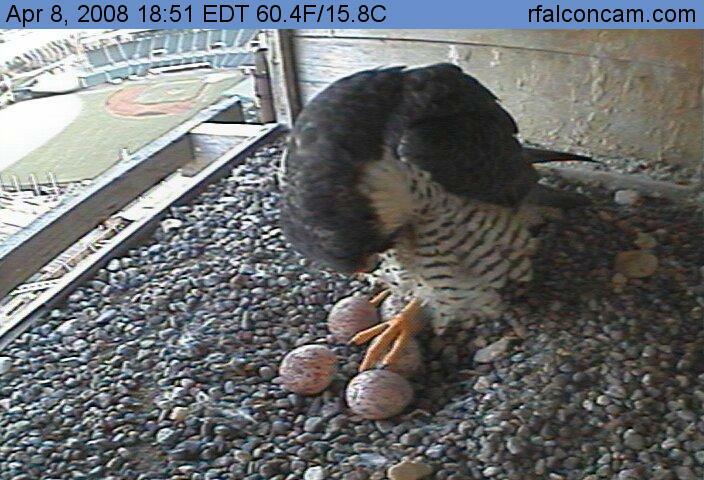 While we wait for Mariah’s five eggs to hatch, we’d like everyone to know that we have restored the family tree to the Rochester Falconcam website for this year. 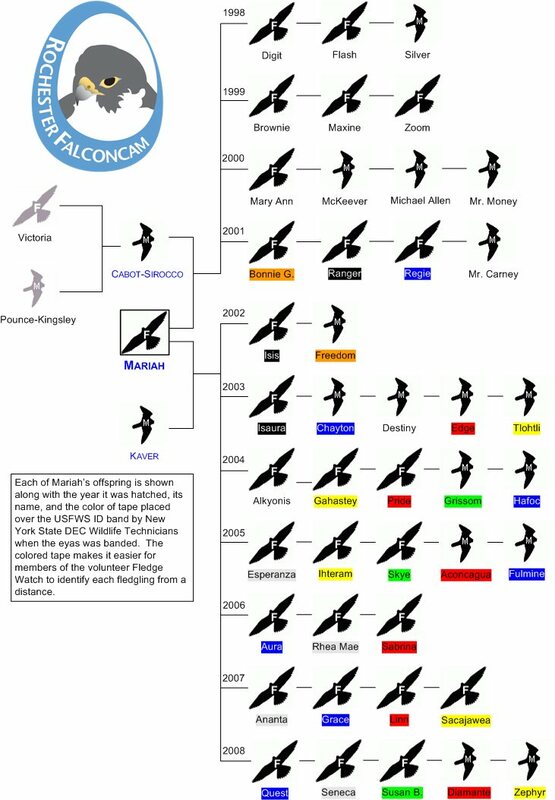 Long time fans will recall that Kodak kept Mariah’s family tree updated through 2006 on the Kodak Birdcam. When the Genesee Valley Audubon Society took over the website, we missed adding the family tree, so we’re happy to be able to return it again for 2008. You can get to the family tree by clicking the History link on the left side of the screen, then clicking Family Tree. Click the small picture to display a larger version. We’ve added some new information to the family tree, including Cabot-Sirocco’s parents, Toronto’s own Victoria and Pounce-Kingsley. We have also added color to some of the eyas’s names. These colors refer to the colored tape that covers the US Fish and Wildlife Service ID band on each falcon’s right leg. The colored tape makes it easy for our volunteer Fledge Watchers to identify each fledgling from a distance. It’s easy to spot the colored tape through binoculars even when the ID band numbers can’t be read, so the tape is a real benefit for our watchers. We have also been working on a history of Mariah’s family, including updates on their current locations and status when that information is available to us. We’re working to add that information to the family tree too, so look for it soon! 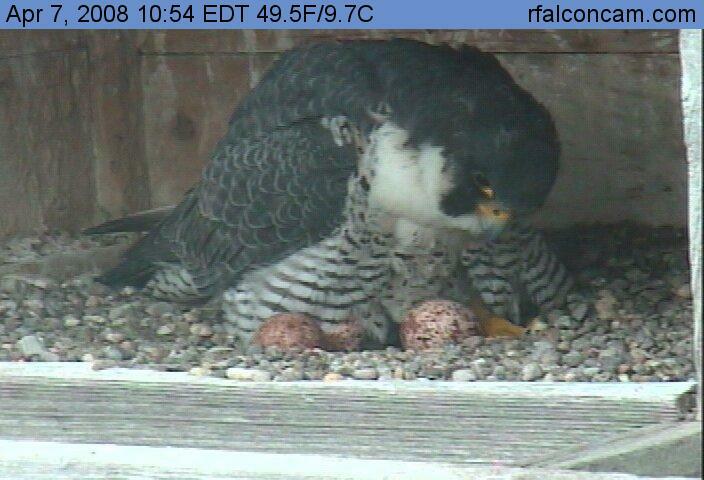 Our good friend Doug in Port Colborne reports that Freedom and his new mate Millie are busy brooding three eggs. Though Millie is only a year old Doug reports that she’s tending the eggs just like an experienced mom. We here at the Rochester Falconcam are all very excited to see how Freedom and Millie do with their offspring this year. We’re hoping for three healthy eyases! Doug sent along a fantastic picture that he took of Freedom on one of his typical perches. The picture was taken just a few days ago, on the 19th of April. What an impressive Peregrine he is! Thanks to Rochester Falconcam team member Carol Phillips for bringing us Doug’s latest report and picture! Offspring Update: Mariah’s Daughter in Michigan! Volunteer Barbara was visiting St. Josephs Catholic Church ( Jay Street ) recently as part of her genealogy research and heard the call of not one but two Peregrine Falcons. 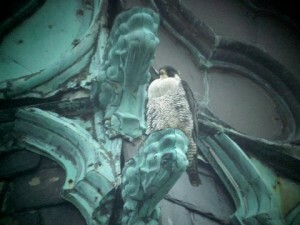 Tuesday, April 8th we confirmed that the Peregrines have chosen this site and are attempting to nest. The bell tower is approximately 250 feet [high] and the pair spends most of their time perched on light poles that extend near the peak of the tower. We were having difficulty determining male or female (both birds seem comparable in size through our spotting scopes down below). Barb jokingly said “We need them to mate so we can determine who our female is.” Within the next 5-minutes we witnessed copulation! We have an unbanded male paired with a banded female (black over red with a sideways 2 on the black and an R on the red)… Prior to leaving the site, we noticed the pair enter a small hole in the screen over the windows near the top of the tower. 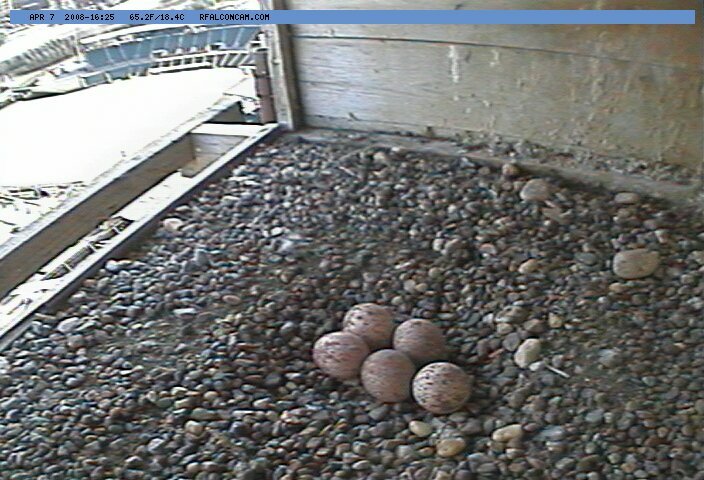 Apparently if they have started to lay eggs it will be on the inside of the church tower. We’ve been blessed with an abundance of good fortune regarding Mariah’s offspring lately. We now have confirmed sightings of five of the Peregrines that have fledged from the Kodak tower since 2000– Ranger, Freedom, Rhea Mae, Linn, and now Ihteram! 2008 is turning out to be a special year indeed. It will be interesting to see what happens with Ihteram and her mate. 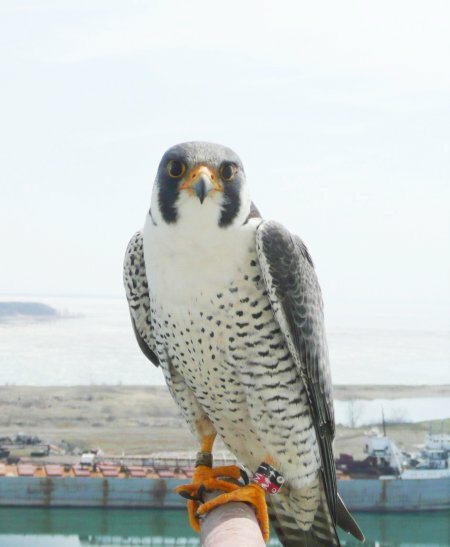 It doesn’t appear that the Macomb Audubon Society has any plan to install a webcam at the church, but they post updates on their website so we hope to be able to learn more about this new branch of the Rochester Peregrine family tree! Photographer Barb Baldinger looks like an accomplished digiscoper! Hopefully this won’t be the last picture of Ihteram that we get to see. Many thanks go to Carol and to Juanita Woods, who tracked down the ID band information reported by Kariann and tipped off Carol to Ihteram’s presence. You may recall that we recently reported the news of a new mate for Freedom. It is unusual, though not impossible, for a first year female to lay viable eggs, so we’ll be eagerly awaiting further news from the Port Colborne nest site. 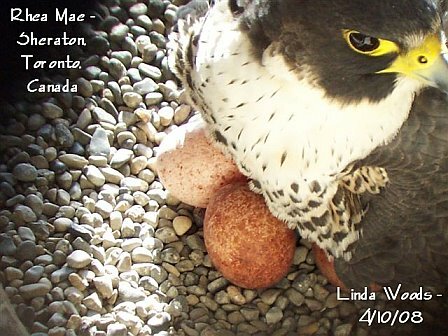 Meanwhile, Linda Woods of the Canadian Peregrine Foundation sends this fantastic image of Rhea Mae as she settles down to brood her four eggs. Thanks to Carol, Linda and Doug for the updates! Brooding appears to be well under way now. Since April 5, Mariah and Kaver have been sitting on the eggs almost full time. 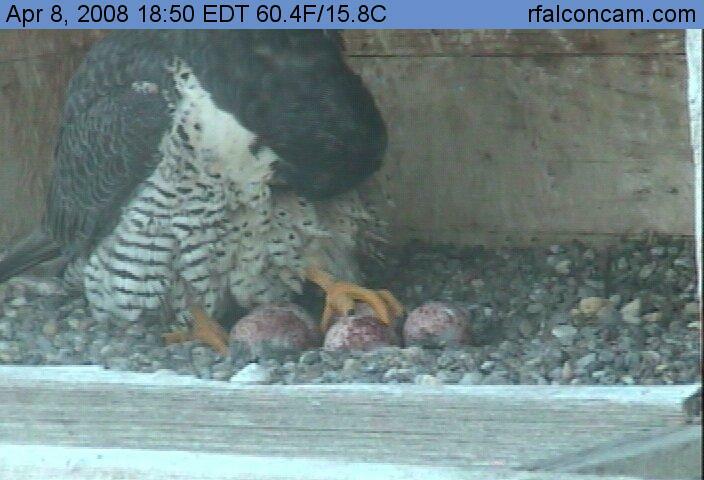 Unless Mariah has another “106 hour egg” waiting in the wings it seems that we have another 5-egg clutch. Based on what we’re seeing, we think hatching should take place sometime around Mother’s Day, a most appropriate time! Last year we talked about incubation, so now is probably a good time to go back and read that article if you’ve forgotten about the process. In that article we mentioned the fact that Mariah and Kaver have to turn the eggs so that they get evenly heated. This is very important for proper development of the growing eyas. 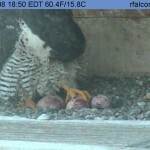 The pictures at the left demonstrate how the falcons turn the eggs. It’s a delicate process that Mariah and Kaver approach with a gentleness and dexterity that can be surprising to witness. Sometimes we hear from viewers who think they’ve seen an egg with a crack in it. 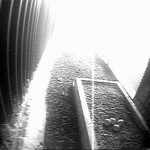 The mottled pattern of the eggs, tricks of light in the nest box, and the image quality from the cameras can all contribute to what look like cracked eggs sometimes. Here are a couple of things to keep in mind if you think you see a crack in the egg. First, Mariah and Kaver have never accidentally cracked an egg as far as we know, so while it’s possible, they’re usually pretty good about protecting the eggs as they turn and brood them. Second, hatching begins with a hole being poked in the egg by the emerging eyas. The inside of a falcon’s egg is white, so if you think you see a crack in the egg, look for white behind it. 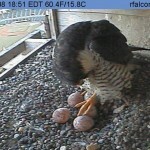 Of course we’ll keep a sharp eye on the eggs and the falcons, and we’ll bring you any news as soon as we learn of it. We suspected that Mariah had laid a fifth egg earlier today, but she and Kaver have been keeping the eggs covered pretty much non-stop, so here’s one of the first views of all five eggs! The last couple of days have seen Mariah and Kaver spending most of their time on the eggs, so it’s reasonable to assume that egg laying may be over and brooding has commenced! Of course, Mariah likes to surprise us so remember to expect the unexpected! 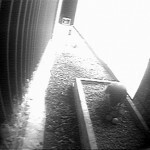 It looks like Mariah laid her fifth egg between 10:53 and 10:55AM. That makes it just a hair over 57 hours since egg#4. In this picture (click for a bigger image) the egg at the left looks darker than the others. That’s usually an indication of a newly laid egg. From looking at the camera images, it appears that she spent a little time rearranging them, then covered them up again without ever giving us a clear look at all five until this afternoon. Rhea Mae, daughter of Mariah and Kaver from 2006, has now laid a total of 3 eggs at her nest site on the Sheraton hotel in downtown Toronto, Ontario Canada. Her third came over the weekend. 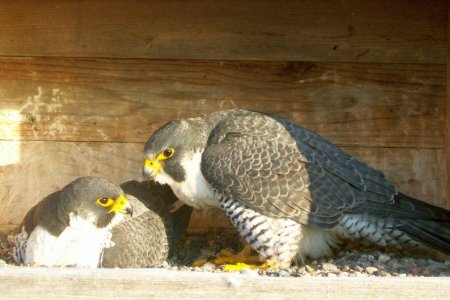 For more information about Rhea Mae and Tiago, visit the Canadian Peregrine Foundation’s webpage. UPDATE! (April 8)- Rhea Mae has laid her fourth egg! We received word just this morning from some of our fans who keep an eye on her nest. This is excellent news to be sure. We’re looking forward to following Rhea Mae and her mate Tiago as they raise their first family together this year. 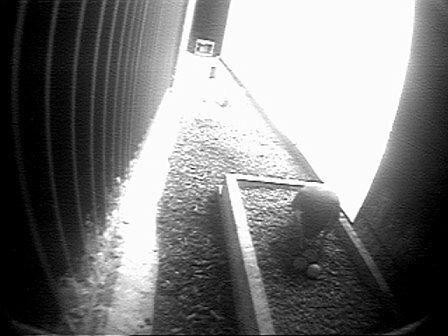 It’s hard to tell from the camera views but it looks like Mariah laid her fourth egg in the early hours of April 5, probably around 1:40AM. 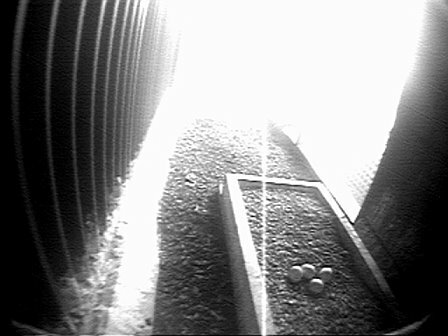 That’s about 57Â½ hours since the last egg. Will there be a fifth? Keep watching to find out! It’s Time to Pledge an Egg! Here at the Rochester Falconcam we’re happy to be able to bring you high quality images and up-to-date information about Mariah, Kaver and their families each year. Most of the work that goes into producing the Falconcam is performed by dedicated volunteers, but we still have expenses for internet access, computer storage space, equipment maintenance and more. We depend on the generosity of our viewers and merchandise sales at The Scrape for nearly all of our funding. You can help to ensure the future of the Rochester Falconcam, and have some fun all at the same time by joining our Pledge an Egg event! Each year our viewers try to guess how many eggs Mariah will lay. We’ve seen her lay as few as 3 and as many as 6 eggs over the past decade. This year, why not turn the guessing into a fundraising event with â€œPledge an Eggâ€! Pick a pledge amount for each egg. When Mariah has finished laying her eggs, probably around the middle of April, we’ll post the final tally here at Imprints. Multiply your pledge amount by the number of eggs and send in your donation. See how much money you can raise for the Rochester Falconcam! Ask your family, friends, co-workers or classmates to â€œPledge an Eggâ€. Just download one of the handy pledge forms below to get started. On behalf of all of us here at the Rochester Falconcam, thank you for your generosity! You are currently browsing the Imprints blog archives for April, 2008.